Just like people have rooms in their house or places they frequent in their neighborhoods, they have different websites associated with different tasks, moods and activities. For this project, I’d like to map out and study people’s virtual homes. To start out, I’ll map out my own digital home. At this point, I think its worth making a distinction between my digital spaces on my laptop vs phone. The affordances of both products and distinctions between app/web design affect how I use each one. The interesting thing about comparing these sites is that there are some that I only visit to achieve a specific task, and others that rest at without a goal in mind. What is different about websites that draw you in vs those that push you out, not only in UI design, but in purpose? How do people feel about the respective sites (for instance, people spend a lot of time on facebook but tend to have negative things to say about it)? What websites do people tend to rest on and what does that say about them? Based on these initial thoughts, I considered a few different directions that I could take the project in. Everyone has their own set of websites that they frequent. It would be interest to map out these websites and see the similarities and differences among people. Does everyone have a different floor plan? Or are the floor plans mostly the same but populated with different sites? Obviously, you can go from site to site by typing different URLs into a browser. However, many websites embed links to their sites in other frequently used areas. It would be interesting to research movement patterns between sites and why some some websites act as entryways into others. I’d like to explore the concept of transposing the activities of a device such as a laptop or phone onto a digital space, more specifically the home. 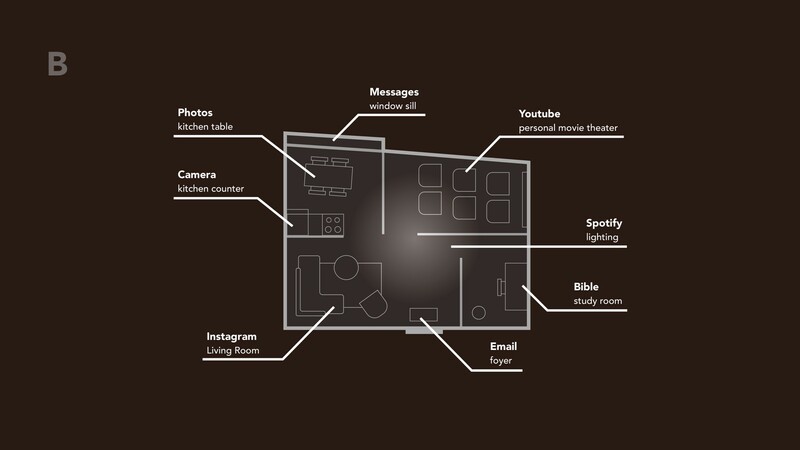 One could think of the websites and apps we use regularly as rooms in our digital house. Just like rooms, we spend different amounts of time in different rooms and use for varying purposes. For instance, one can spend hours in the living room doing next to nothing, but may only go into the kitchen to prepare food. Similarly, I spend long periods of time passively scrolling through facebook, but only go to gmail for short periods periods of time to contact specific people. These rooms make up a larger floor plan. 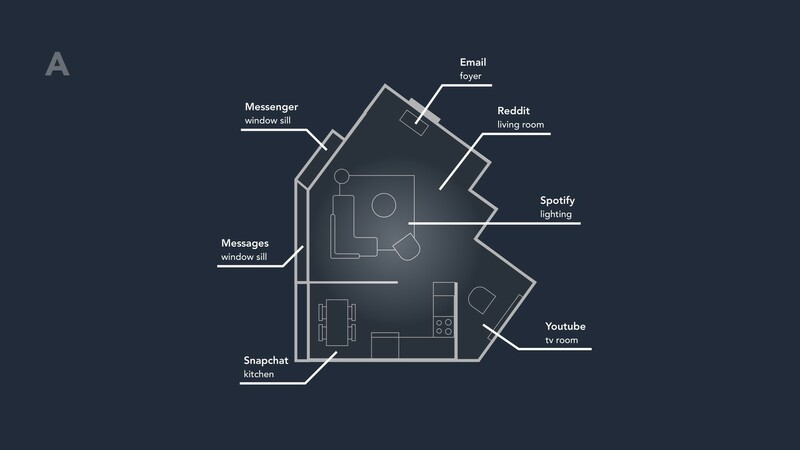 Just as someone’s house reveals information about themselves, I’ll predict that someone’s digital floor plans will reflect their habits, values, and personality. Just as we move from room to room via doors or openings, we must move from various applications to others. However, the way that we do this is not always as straightforward as typing a URL into a browser. Sometimes one website will link to another, and the user will move through them without even realizing it. The final factor to consider is how people occupy the digital rooms that their in. Although one cannot be in more than one physical room at a time, some houses contain open floor plans where one can, for example, work in the kitchen while overhearing the conversation in the kitchen. Digital applications can work in a similar. 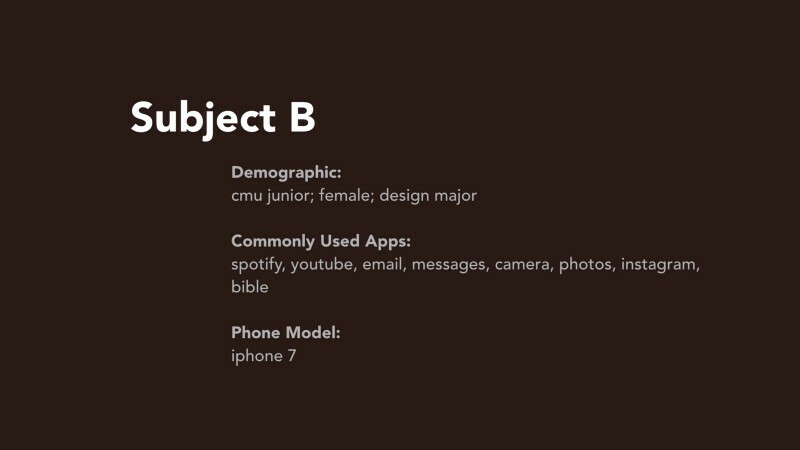 One can have his or her Spotify playing while writing a paper on google docs, or receive text message notifications while checking their email. From these interviews, I plan on constructing visual maps of people’s digital homes. From these maps, I foresee gaining a better sense of how people access and use digital products, identify possible that occupy similar spaces in people’s digital homes, and perhaps spark inquiries about what these products will look like and how they will interact in AR/VR. I ended up interviewing three people. Each interview followed a 5 step process. 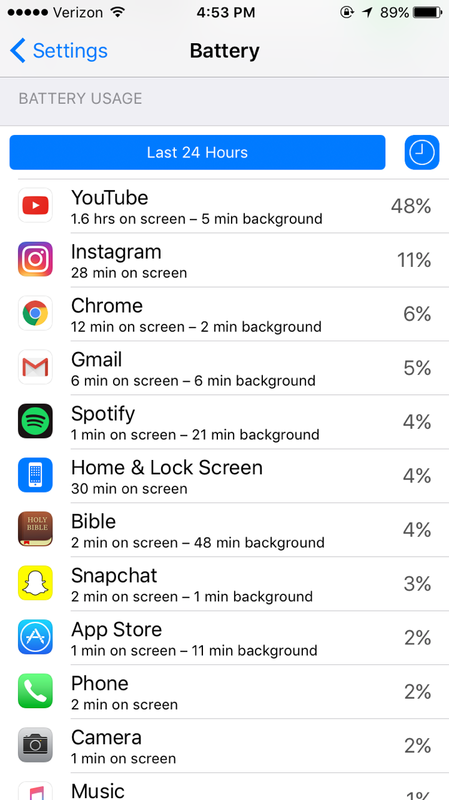 First, I would ask each individual to open up their phones, go into settings, then battery usage, and show me what their most used apps were for the past day or week. After listing the apps, I would go down the list and ask how and why the individual used each one. I would then go through the list of apps again, now specifically asking what prompts the users to enter these apps (is it built into a specific time of day, due to receiving a notification, or simply boredom). Finally, I would go through the list one last time and ask if and how the individuals multitask while on the apps, or if they are completely engaged while using them. I would also ask how likely the users are to leave each app if he/she receives an external notification while in the app. 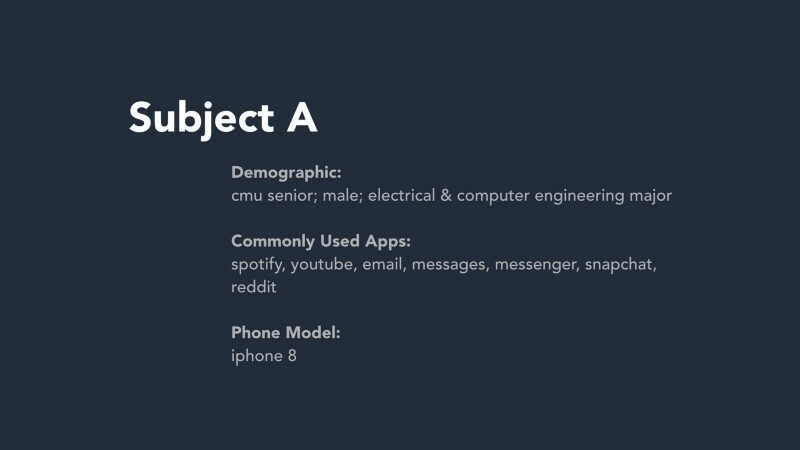 Lastly, I would ask the users to take out their phones again and briefly discuss how they chose to organize their apps and what that might reveal about their usage habits. Here are the raw transcriptions that resulted from each interview. - prompt to enter: if i know i’m about to walk somewhere (as i’m walking out the door) or right when i get back into my room. Open it to play music when i know ill be spending a few minutes alone and don’t have to pay attention to anything else. Sometime i switch music but usually stay with what i’m playing. Usually pick something and let it play. queue up a playlist. messages — use to text people directly, usually closer friends than on messenger (in order to text someone have to have their number) don’t scroll through. 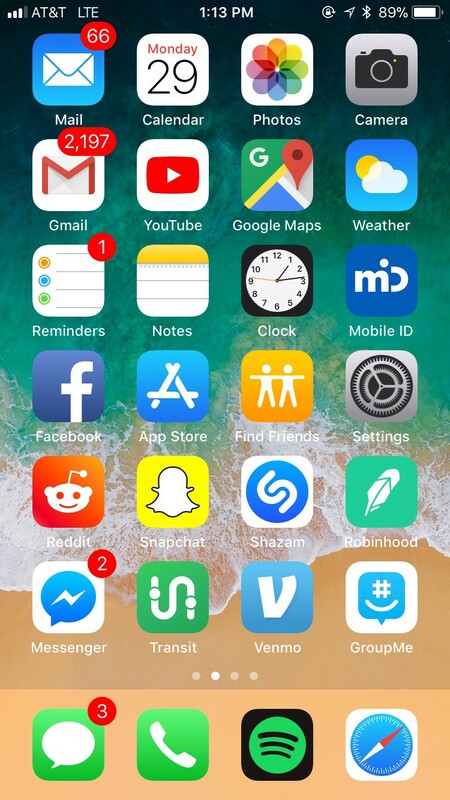 facebook — open when i get notifications (on the corner of the app) and don’t like red dots on my app. Usually don’t care about notifications. Will sometimes scroll like on reddit but not as often. email — most serious think i do on my phone. Normally check on laptop but if i’m walking between classes will sometimes check, if its time sensitive or relevant. Don’t usually write emails on phone, only check. Won’t scroll through content, not that much new content. If i get a notification will check it but wouldn’t scroll through. youtube — usually use as redirect from reddit. Reddit will have a youtube video to watch so I’ll click on it on reddit. Could watch on reddit, but will purposefully open in youtube to up vote or find more similar content. Occasionally go to youtube directly but will usually only do that on laptop. google maps — use it for navigation or when I’m hungry i’ll open maps and just search for food. Usually with the intention of getting food but doesn’t mean i’ll end up going to get food bc often I’ll check a restaurant, see if its closing soon and then decide to eat at home. Lately been tracking where i go every day and checking that bc its interesting, checked it only a few times. a bit idle, even though i have a clear objective when i have open it, its not as immediate ( for food stuff) it its navigation then I’ll do it while doing other things pertaining to goal (like getting into car). when getting into car to go places will open spotify and google maps to get going. clock — use it to set alarms. Wake up to an alarm every day to every night i’ll set an alarm. Sometime for timers for workouts or laundry. phone — for calls either for picking up a call or making a call to girlfriend or parents. Occasionally will call ahead to a restaurant or something. Will sometimes get spam call. next page (like i arrange things on bookshelf, has always stayed consistent). First page has always stayed the same. Has stuff I use most often, on bottom is also what i use most (or what I thought i use most frequently) Kakao talk i use to communicate with family so important to me. Grace to you sermons I listen to during the day also when i go to and from home. last page is fb products. don’t like them but have to use them to choose to put them in the back. have space to put them earlier but purposefully don’t put them there. Youtube — entertainment, listening to choreography music videos or background music playlist while working, watching videos while eating. Used youtube for protest project. prompts to enter: notifications on lock screen from subscribe channels, kind of like a package in the mail and you hear the doorbell, at the end of the day my subscription list grows and i watch it all at once. At the end of the day watch all the new video uploads. Have a time put aside at the end of the day. If i don’t have anything else to do after done with new videos will go to trending and watch those too or will watch recommended videos for similar content. as a playlist can multitask. Instagram — scroll while eating or walking, gathering info about things i’m interesting in at that time, recently into this animation artist, would look at his work. Different weeks I have different interests. For research for projects or personal interests. Multiple instagram accounts (public, close friends, persuasion class. prompts to enter: like looking at good design/food/pretty people, get notification but is my default social media app, curated feed of your interests. Look at nice photos of nice things and it makes me feel better. Don’t need a prompt to go into instagram, a hobby I like so i just go into it. Between classes I have time to go to la prima, or finish my essay, in moments of empty time, space, or in places where it looks socially unacceptable to not do anything. Feel compelled to fill the space. prompts to enter (posts): when another person posts makes me want to post. groupthink mindset. In my personal instagram account when i see other friends post i feel motivated to post (but only perfect people). Only when specific people post am i motivated to post. Or if I’m at a place on vacation or with a group of friends and I feel urge to share it. the fact that you can scroll so easily without getting hindered makes it easy to leave. prompts to enter: set a time to read email (turned notifications off bc too stressful). Check in morning after read bible and get ready. Constantly check in phone, have natural urge to check it. Look through new emails. Know what I’m expecting, check those, then exit out. Only check emails, don’t normally answer on phone. browse only, so very easily distracted to leave gmail app. Not the case on web version. Pretty quick bc just see something and leave. 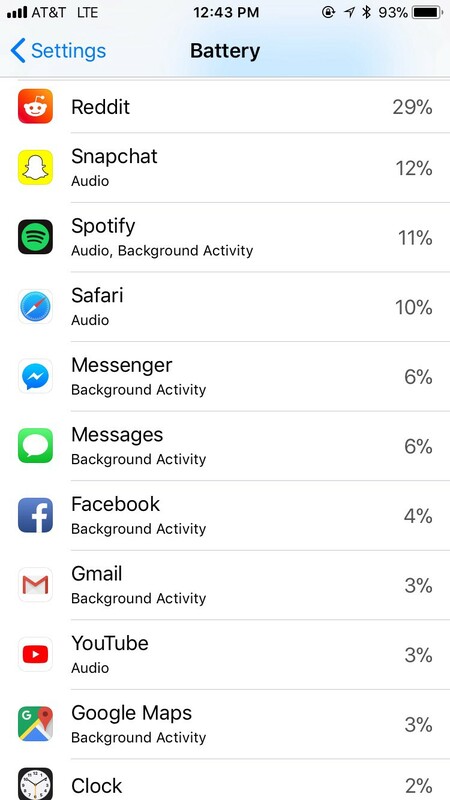 Spotify — Walking/traveling time, don’t listen to music while i work (going home, coming to school). Have playlists that I always listen to when i go home, like background music, walk to that tempo. Were too many people so became feed of nonsense. almost always multitasking, only use it when commuting, background to physical environment. Specifically for walking home or to class from. Put on a playlist and won’t change it. Bible — in the morning, when i have my quiet times, is a reading app, spend like 30 mins reading and write in my journal what i think about. Important part of my day, sets the tone for the rest of the day. Sometime listen to it while I’m walking. prompts to enter: most structured. Have particular time in day, while drinking morning coffee. Have highlighted verses, have a streak of how many days i’ve used it, in a feed format, verse of the day, has read tab with bible content. In morning read the verse planned on reading. Sometime someone will recommend me a verse and I’ll go to that during another time in the day. Feed is my own history so i go to it a lot, feels very personal. Mostly try to stick with the plan but if i don’t have time or don’t want to read than I’ll go to the feed. in the morning i won’t get distracted, try not to leave bc its my only time to do that and its a different part of my day. certain apps have a different value in my life. Bible is part of who I am so i try not to get distracted. will also listen when i’m walking home, will listen to when I’m walking home too, more straightforward things i’ll listen to when walking, things i really have to pay attention to understand meaning I’ll do in mornings. Phone — don’t call too often but when i do either i need an immediate response or its urgent. prompts to enter: When someone calls me or when i need to call for appointments. Housing bills, stuff. My friends and family don’t call me too often, but i video call my family. Have a clear goal in mind when using it. prompter to enter: see something in my environment thats interesting or i want to go back to, motivated to take a picture. bc I’m on the go when I use it I tend to leave the app after i’m done. prompts to enter: texting or call my mom, go to it to get photos to send. Go back to look at past photos, prompt is nostalgia, having a bad day, want to post something on instagram, look through what I’ve taken in the past. When I’m reminded of something i did earlier that day and have a moment to look back at it. prompts to enter: only if i have a plan to see where my friends are at. have a clear goal in mind( look for friend) but then after located friend look at where all other friends are. spotify — listening to music, discovery of new music, play as ambiance as i go through my day. during tasks such as traveling to and from places, working with low cognitive load (was a communal experience to share). Trigger happy. Often change songs (pretty much until that song is finished) and then change, will also queue up songs. prompts to enter: longer passive moments in my day that i want to provide energy for. also listen to podcasts during long period of time. preemptively open spotify for my walks. twitter — check on casual thoughts from interesting people (professors, designers, political figures, people who i respect the thoughts of) very recent. A good way to get links to related and unrelated news. Will get links to news or opinion articles (ideo, articles about technology). How do i expand my taste in people or my taste in design. Sometimes check in the morning, if i have an hour or so break in the day. Often happen to read articles. Also write my own content. prompts to enter: intentionally open up twitter, use is very intentional. I’m about to open instagram and will choose to open instagram again. sometimes during dead time but usually very purposeful about time. want to curate it better. messages — use it to talk to friends, no distinction between messages and messenger, don’t have as many contacts on messenger than on messages. If someone doesn’t message me on one i’ll message them on the other. prompts to enter: when i get a text. generally try to reply pretty immediately unless i’m avoiding something, but really try not to put it off, do put callbacks off though. facebook — to check up on friends, I just spend so much trash time on Facebook, I don’t think I even get any value out of it. Trash videos that i get stuck on show up. Biggest value I get is from events, a lot of friends make events on fb. What my extended friends are doing. Go on Facebook when I’m sitting, prior to getting work done or when I’m bored of work, intentionally transitioning to using twitter when standing in line, waiting for stuff. prompts to enter: when I’m standing in line waiting for something i open Facebook without even thinking about it. Rarely with a goal in mind, unless for an event or birthday, just scroll through, sometimes without even reading anything. multitask while on Facebook, don’t dedicate focus to in the first place, allow my attention to drag focus from on Facebook. See content as less valuable bc don’t care as much about people generating content. poly mail — emails. notifications bothers me so i like getting rid of notifications and delete/archive stuff. Check email often to make sure i’m not missing anything. Also get a lot of ads. Only read on my phone unless theres an immediate response needed. I hate sent on my iPhone signature. Usually check when i notice my notifications go up. prompts to enter: with working out its an activity that i use youtube for, other times i think of something i want to watch, sometimes during dead time but only if i have enough time. Usually play music on youtube before going to bed. Spotify will keep going forever but youtube will stop after one, usually have specific goals in mind at school not the case at home. phone — call people. FaceTime my family a lot, boyfriend before going to bed. If i want to catch up or get someone immediately i prefer to call then to message. Believe in conversations of phone calls more than texts. A lot of lost language in text. when someone calls me or when i need someone’s immediate attention. usually have a specific task in mind. messenger — people that aren’t in my closest circle. linkedin — job obsessions, look for ways businesses are growing, see what recruiters are posting, rarely read posts bc repetitive and not very insightful. Used to use it for articles but articles are often very surface level. Like twitter better bc it feels more freely expressive. photos — use a lot to think about what i want to post on instagram or twitter next, when i miss a friend I’ll look at pictures of person or watch videos to remember events. Go on it whenever, but when i do I start going backwards far. Go on to look for something to post and will then get lost going really far back. venmo — transactions for paying for other people’s meals, splitting costs of stuff with roommates. prompts to enter: remember to pay people, usually pay back on own accord, try to do things immediately. 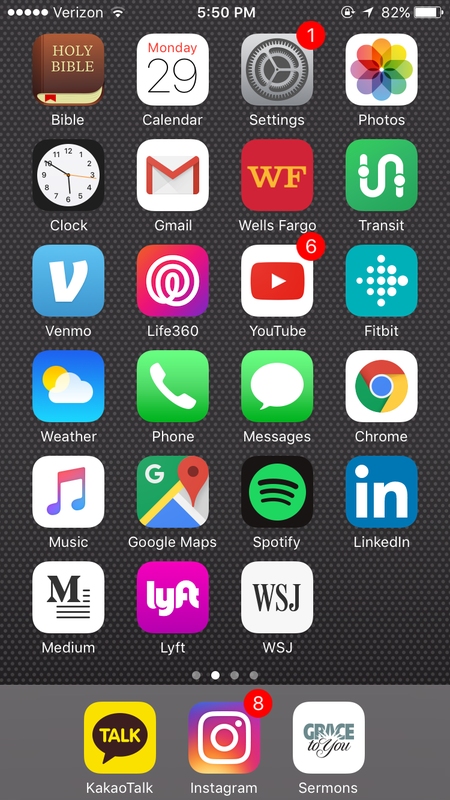 Based on the interviews, I then recorded the most frequently used apps and associated each one with a room. Finally, I drafted the floor plans on sketch and compiled them into a presentation. Many interesting things can be gleamed from the results of this project. I was fascinated with how apps like gmail were used in a very consistent manner while youtube was used differently by each person. 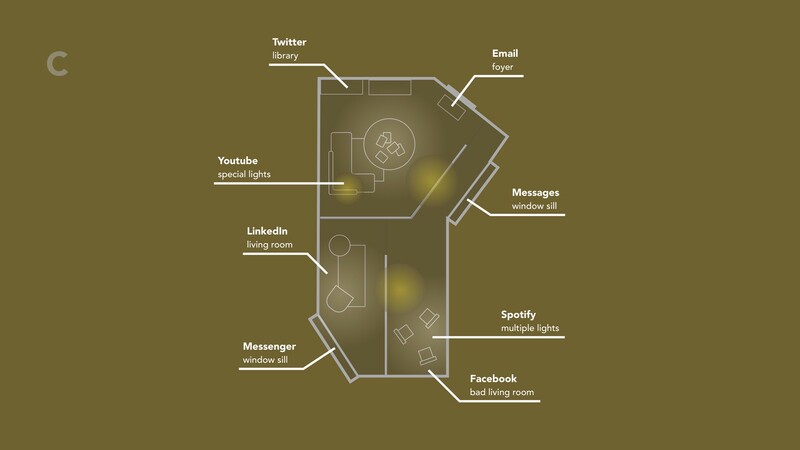 Conversely, some spaces, such as the living room or kitchen, were occupied by different apps for each person. Finally, I found it interesting how people’s floor plans reflected their actions, and in some cases, how they were trying to change their actions. For instance, Person C’s primary space is twitter, which fulfills the role of a library. This was a conscious choice that she was making to avoid what she perceived as wasting time by defaulting to scrolling through facebook. Making these maps was not always as straightforward as I would have liked. As metaphors, they are bound to be imperfect. However, I greatly enjoyed the process. 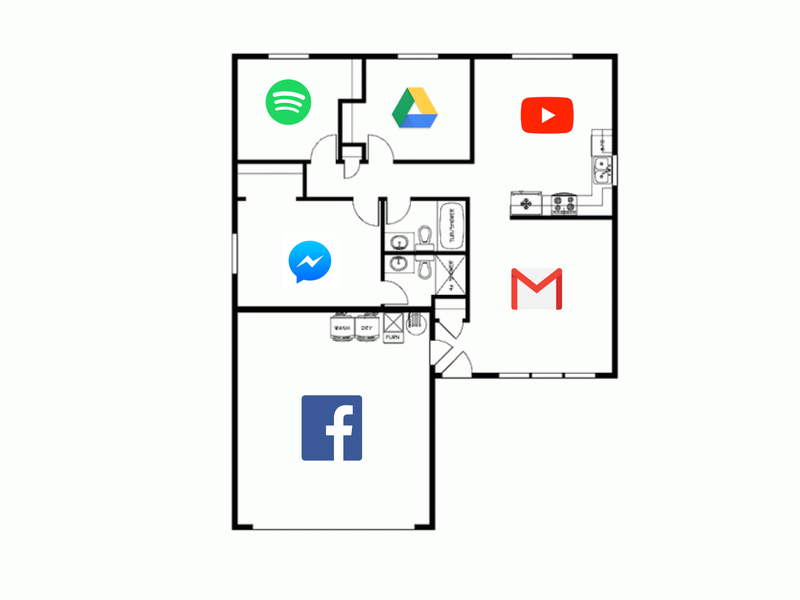 I feel that if I were to interview more people and construct a wider array of floor plans, interesting discoveries could be made about user patterns and competition among apps.